Ductile fracture has been identified as the predominant mode of failure for structural elements under extreme loads and the prediction of such represents considerable challenges. Until recently, ductile fracture of metals has been recognized to be dependent on both stress triaxiality and Lode angle parameter. In this study, a new fracture model that is dependent on both parameters was developed to address the case of monotonic and cyclic loadings. The developed model was then interfaced with finite element models and utilized to evaluate the behavior of commonly used connection in steel bridges including gusset plates, coped beams, and shear links. The evaluated behavior included fracture profiles and load-deformation curves and were found to compare very well against experimental results. 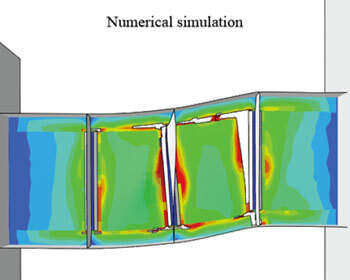 The fracture model, along with the finite element simulations, allowed for accurate capturing of the complex behavior of connections and can be used to shed light on the adequacy of current code provisions. Mahmoud, Hussam, and Huajie Wen. A Modified Approach for Predicting Fracture of Steel Components Under Combined Large Inelastic Axial and Shear Strain Cycles , MPC-18-345. North Dakota State University - Upper Great Plains Transportation Institute, Fargo: Mountain-Plains Consortium, 2018.